Sunseeker was introduced to the world in the early 1970s, when a man named Robert Braithwaite was finally able to realise his dream of creating boats that would fulfill the demands of the sports cruiser market in the United Kingdom. A former employee at boat sales company Friar’s Cliff Marine, Braithwaite found a business opportunity when the American boat builders (one of the brands that consigned with Friar’s Cliff Marine) Owens Cruisers decided to pull out from the UK. Braithwaite, who had been able to negotiate a deal to acquire Owens Cruisers’ boat models, launched Sunseeker’s first boat, the Sovereign 17, in 1971. It was Formula One driver Henry Taylor who would help the company get its big break by asking for a boat that could accommodate a full-width sunbed. The team set about completing the request, producing a model that would become a big hit. With an office and shipyard located in Subic Bay, the boating capital of the country, Sunseeker Philippines is set to meet all its clients’ needs from yachting matters such as docking facilities and boat maintenance to fully-focused customer service like aftersales and warranty concerns. Heading the team is Managing Director Luke Prince, who was with Sunseeker Asia prior to taking over the Philippine operations, which he now runs with his business partner, Mark Prangnell of HYS Yachts. Costs aside, one of the biggest concerns of first-time yacht owners is maintenance. With Sunseeker Philippines, they need not worry, as its full-service shipyard is well-equipped to handle just about anything. “The Philippines has a great concentration of skilled labourers, which has enabled us to hire 10 engineers and technicians focused exclusively on the after sales and service of Sunseeker—and clients always come first,” says Prince. Sunseeker Philippines currently has several of its models docked in Subic, mostly from its yacht (76-131 metre) line. 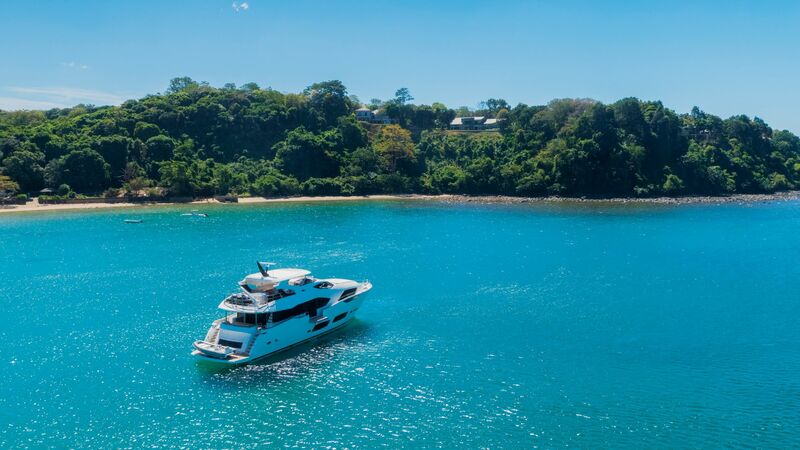 The 76 boasts spacious exterior decks than can be customised according to the clients’ entertainment needs, whether that be a hot tub, additional sunbeds, or even a cocktail bar. The 86 delivers on all fronts, sporting an outstanding level of craftsmanship from bow to stern, all the way below deck. Streamlined and cutting-edge, the 95 showcases the feel of a superyacht with practical advantages, optimising space to ensure flexibility. Taking sophistication to the next level is the 116, which combines superb performance with Sunseeker’s bespoke interiors—every element can be customised according to the clients’ wants and needs. Prince looks forward to branching out, hoping to hold operations in Cebu once the new marinas are ready. He is interested in starting a charter business as well, renting boats out to locals and foreigners for bespoke holidays with the inclusion of custom itineraries specific to the destination of interest.